The apex Igbo socio-cultural organization has split into factions following the endorsement of the Presidential candidate of the Peoples Democratic Party (PDP), Atiku Abubakar. Notable Igbo leaders have described the endorsement as a charade. However, the development has drawn the ire of some other Igbo leaders, especially members of the All Progressives Congress (APC), prompting a media briefing late Thursday night. Atiku was endorsed same day Buhari had visited Anambra and Enugu States, where he commissioned some projects. Those present included the Minister of foreign affairs, Mr. Geoffrey Onyeama, the minister of Science and Technology, Chief Ogbonnaya Onu, minister of Labour, Senator Chris Ngige, former Senate President, Chief Ken Nnamani, former governor of Enugu State, Barr. Sullivan Chime, the Director-General of the Voice of Nigeria, Mr. Osita Okechukwu, Gen. J.O.J Okoloagu (Rtd.) and Prince Richard Ozobu. 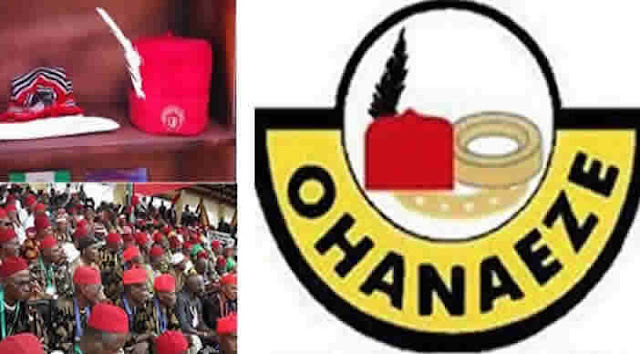 Apart from their claims that over 90 percent of the members of Imeobi were not at the meeting, they equally said the power to carry out such endorsement was vested upon the Ohanaeze General Assembly and not the Imeobi. They equally said the meeting was mischief, having held same time President Buhari was still attending functions in Igbo land. Ngige told the media that the President-General of Ohanaeze, Chief John Nnia Nwodo had earlier agreed to move the meeting till 7 p.m, wondering why it was later held by 4 p.m and a decision hurriedly taken. “Myself and the Chairman of the Southeast Governors’ Forum had approached the Ohanaeze President and pleaded with him to change the date. He said he cannot do that; he later gave me 4 p.m, but I told him it was not going to work. “By 5 p.m, they met and issued an already prepared communique. “All of them that met are Ohanaeze PDP. So, it is now Ohanaeze PDP vs Ohanaeze APC. They have factionalized Ohanaeze. “I want to say clearly that endorsement has never favoured us; they endorsed Falaye, he failed; they endorsed 3rd term it failed; they endorsed Jonathan he lost. We are not going to continue on this trajectory. On his part, the foreign minister, Onyeama said the development would have consequences for years to come. “Mr. President was visiting two Igbo States, where he commissioned projects, including the Mausoleum of the great Zik of Africa. So, it was inappropriate to have a meeting of Ohanaeze to discuss such a weighty issue on who to endorse. It was not the time to hold such meeting. “I see this as a decision that will have consequences for years to come. This is not decent for the Igbos,” he added.